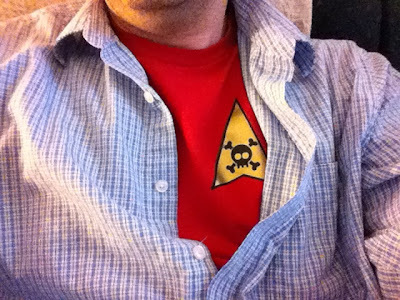 Given the events of this work day, is it any surprise that I foolishly wore this under my dress shirt? Stupidly tempted the fates . . . I didn't realize until after I posted this that it could be mistakenly interpreted. To be (a bit) more clear--there were no big layoffs at work today and I still have a job. Sorry to worry anyone unnecessarily.